I woke up this morning and practically ran to the TV to catch the start of the live NYC Marathon coverage. Marathon day was always my favorite day of the year when we lived in NYC and even now, I soak up as much of it as I can. Watching the live stream on TV and the ESPN app (so I can see & hear the commentary), track my friends on the TCS NYC Marathon app and am glued to social media all day following along. Anyone else obsess about it like I do? Maybe one day I'll get back there and take the most amazing tour of New York City again. So, in the spirit of the most awesome day of running each year, I thought I'd share a few items that help me get through my runs - the easy ones and the tough ones. One of the best things about running is that all you really need is a pair of running shoes, but other things like great socks, layers, and more, can help make the run a bit easier and enjoyable. Quick note: all of these items are mine and none of these brands know I'm writing this. I just really love them and want to share. This time of year, layers are a must for runners. I love these pieces because they fit well, work for the in-between weather days, and super cute. As you know, I'm a big fan of Oiselle - two of my favorite pieces are the lux layer long sleeve, which is incredibly soft and the perfect weight, and the aero tights for their moto design, ankle zips, and a back zip pocket that even fits my xl Galaxy S7 phone and holds it tight while I run. I've worn these for training runs and races for over a year now and always get compliments. I've also been wearing Stance socks over the past year and love them for the great feel, how they hug my feet, ideal thickness, and that they come in several different heights and fun designs. Momentum Jewelry was one of our BirdCamp Colorado partners this year and provided us with these great motivate wraps for all the campers. I love mine and this one speaks to me strongly right now. They are lightweight and comfortable so you can forget you're wearing them during your run till you need a little boost. 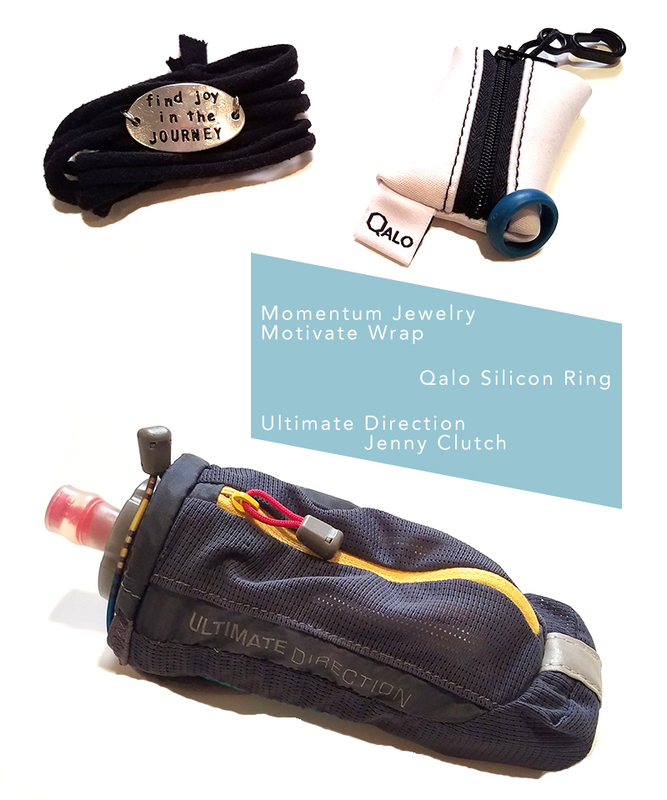 After seeing Rebekah and her husband wearing Qalo rings, I was intrigued because my fingers always swell when we go hiking and trail running. I got rings for Matt and myself for our wedding anniversary this year and we both wear them often. They come in a ton of different colors and are really inexpensive and virtually indestructible; both excellent qualities. Last, but certainly not least, is the UD Jenny Clutch. I was looking for a new handheld before we went to Breckenridge for a trail run this summer and I'm in love. It's lightweight with a soft and collapsable, 17oz bottle, has never leaked, and the pouch is quite big and easily fits our VW key plus more. While not all of these items are essential for running, I do enjoy using them when I'm running (and when I'm not). Maybe there's a great holiday gift in here for one of your friends - or for your own wish list. I'd love to hear what some of your favorite items are right now that are helping make your run life a bit brighter. If you're a marathon runner, what's your top tip for runners training for (or thinking about) their first marathon?